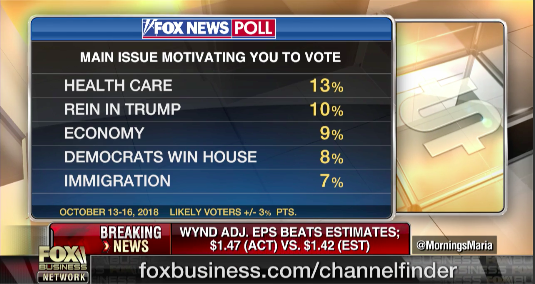 When the dust settles Wednesday and mid-term results are in, healthcare is certain to be the wedge issue that helped elect or defeat the winners and losers. Gallup’s polling going into the final week showed healthcare as the No. 1 issue to Democratic-leaning voters (87%) and No. 4 to Republican-leaning voters (72%) behind the economy, immigration and taxes. Like most, I welcome relief from tortious advertising and the lack of civility that has characterized the mid-term races. Our political discourse has reached an all-time low, and the collateral damage is palpable—eroding confidence in our electoral process, the Presidency, Congress and our media. Discerning the distinction between news and opinion has become virtually impossible: the lines blurred in this election cycle. Count me among the many who bristle at the avalanche of gotcha campaign ads funded by Super PACs with innocuous names like Congressional Leadership Fund, Senate Leadership Fund and America First Action on the right and Independence USA, Women Vote and League of Conservation Voters on the left. Collectively—as of November 3—2,224 groups organized as Super PACs reported total receipts of $1,309,631,916 and total independent expenditures of $807,680,408 in the 2018 cycle (Center for Responsive Politics). Both sides are complicit. Against this backdrop, ads about healthcare were prominent. Healthcare was featured in 45% of all mid-term campaign ads—double ads about taxes, the economy, immigration and other issues. Democrats ran more as about healthcare than Republicans: in Senate races, three times more likely (60% vs.21%), in House races (59% vs. 38%) and in Gubernatorial campaigns (42% vs. 14%). Ads funded by dark money were 11.2% of total ads run, and negative ads were at an all-time high: 61% higher than the 2014 mid-term. (Wesleyan Media Project). In campaign events and televised debates, candidates on both sides followed focus-group-tested talking points on issues like pre-existing conditions, Medicare for All, Medicaid expansion and drug prices hoping to solidify support from their core voters without saying too much. And their campaign websites were light on details and heavy on partisan posturing. Regretfully, though healthcare was a prominent issue, the public is no wiser about where we are or what’s ahead. Thirty-second advertisements are no substitute for meaningful discussion. Gotcha soundbites are no substitute for reasonable debate and thoughtful analysis of health policy options. The fact is, candidates and campaigns on both sides used healthcare to score points with their supporters by saying as little as possible. And journalists gave them a pass: coverage about how their solutions might work, be funded or who would benefit was rare, especially in broadcast media. As a result, the public’s understanding on key issues in healthcare is essentially unchanged though a major factor in their voting. Wednesday morning, DC pundits will begin speculation about changes in leadership of important Congressional Committees and likely aspirants for the White House in 2020. Statehouse watchers will opine on the effect of 36 Governor’s races and elections for 6,000 seats in state legislatures. In four red states (Utah, Idaho, Montana and Nebraska) referenda to expand Medicaid will be settled, and Section 1115 demonstrations and Section 1915 and 1332 waivers will be on the table in the rest. Healthcare will be prominent as attention shifts to November 3, 2020—our nation’s 59th quadrennial Presidential election. But the public’s understanding about healthcare is unlikely to change unless and until healthcare education is addressed head on as a national priority. The healthcare industry will continue to grow: total spending will exceed 5% annually for the foreseeable future. It will continue to benefit its biggest players: large integrated health systems, national insurers, drug and device manufacturers and large, independent medical groups will gain competitive advantages over smaller rivals. It will continue to be a safe bet for investors: the Standard and Poor’s Health Care Index is up 192% since passage of the Affordable Care Act (March 2010). By comparison, the S&P 500 and Dow Jones increased by 141% and 138%, respectively, according to FactSet. It will continue to be ripe for innovators and disruptors: Solutions that demonstrate better, faster, cheaper ways to deliver or pay for health services will flourish. But the public’s understanding of the industry—how it operates, trade-offs between access and costs, personal accountability, how quality of care is defined, innovation and more—will likely be relegated to campaign ads and campaign talking points unless and until taken seriously. Campaign 2020 starts Wednesday. Healthcare will be front and center!